With 250 entries, this updated filmography and resource is the encyclopedic guide to all things lycanthropic and a fascinating compendium of comparative mythology and folklore. Delving into the 15th century to uncover the origins of the werewolf legend, it is an eye-opening, blood-pounding tour through the ages, landing on the doorstep of creatures like hirsute mass-murderer Albert Fish, Michael Lupo (Lupo is "wolf" in Italian), and Fritz Haarman who slaughtered and ate his victims–selling the leftovers as steaks and roasts in his butcher shop. The photos and drawings provide hair-raising evidence of strange and obsessional behavior through the centuries, and a helpful chronology of lycanthropic activities dates back 140,000 years to the first mixing of human and lupine blood. Werewolf hunters of all ages will appreciate the detailed section on slaying the beast, while potential victims will find the information on detecting and warding away the occasional wayward wolfman more to their immediate liking—if not need. "Brad Steiger's magnum opus, a labor of deep scholarship elegantly written. As a reference source, it is invaluable for anyone interested in pursuing the werewolf." 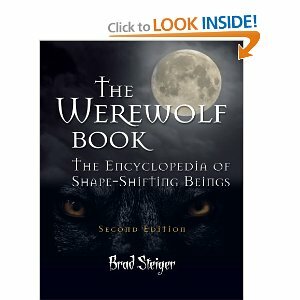 "From A to Z, Brad Steiger presents a true encyclopedia of werewolfism, a reference masterpiece, overflowing with fascinating information to make readers think and shudder." "It is with reverence to its awesome scope that we recommend it to anyone even marginally interested in the topic"
From movies like An American Werewolf in London to the best-selling game, Werewolf: The Apocalypse, to folklore and case histories, The Werewolf Book is the encyclopedic guide to all things lycanthropic. In this spectacular first edition, Brad Steiger takes you back to the 15th century to uncover the origins of the werewolf legend. From there he leads you on an eye-opening world tour through the ages to the modern-day monstrous duality of creatures like cannibalistic serial killer Jeffrey Dahmer. The Werewolf Book, Brad Steiger's homage to the beast within, provides a full moon of fact and fiction for the lycanthrophile in all of us. --This text refers to an alternate Paperback edition. Brad Steiger has been devoted to exploring and examining unusual, hidden, secret, and otherwise strange occurrences for nearly five decades. He is the author of numerous articles and more than 150 books on paranormal theme, including Real Ghosts, Restless Spirits, and Haunted Houses; Real Monsters, Gruesome Critters, and Beasts from the Darkside; Real Vampires, Night Stalkers, and Creatures from the Darkside; and Real Zombies, the Living Dead, Creatures of the Apocalypse. He lives in Iowa.